A new update to the current staging system has been developed to help expand the treatment options of some late-stage pleural mesothelioma patients. This new staging process will officially go into effect in 2017, but a majority of clinicians will already begin adapting these new methods of diagnosing into their everyday practice. Dr. Valerie Rusch, a renowned mesothelioma specialist, of Memorial Sloan Kettering Cancer Center in New York, has been lead of this project. Currently, mesothelioma disease staging is based on one of the most commonly used systems called the TNM Staging System. The new staging update revisits the characteristics of a stage 3 and stage 4 diagnosis. The biggest impact of changing the staging system is how the concept of stage 4 is going to be diagnosed and how stage 3 is going to be re-categorized. Instead of categorizing patients that have large tumors as stage 4, the new system creates a stage “3b”, which allows these patients to have more treatment options. By creating this new category between stage 3 and stage 4, there may be a significant change in the expected survival rates of some patients. Some patients who previously would have been classified as stage 4 will now be included under stage 3. Not only does this new diagnosis provide both patients and their loved ones with hope, but it also provides patients with opportunities to seek more surgical and therapeutic options. In many circumstances, some treatment options are not available to patients diagnosed as stage 4 whereas a stage 3 patient could have participated in those treatment options. The new staging methods should help more patients be classified as stage 3, expanding their treatment options. Cancer stages use the location and the progression of the cancer to classify a patient’s condition. By knowing these factors both a patient and their physician are able to determine what treatment methods will be needed to improve the patient’s prognosis. The current most popular staging system for mesothelioma is called the TNM Staging System and it is broken into letters that represent the spread and size of the cancer. Numbers also coincide with these letters (TNM), which provide more detailed information about the cancer. Doctors then use a patient’s TNM identifications to categorize them into stage 1, 2, 3, or 4. The update to the system will change how TNM translates into a stage. “For instance, right now, anything that’s stage T4 is considered stage 4 disease, and stage 4 disease for any patient automatically means ‘the end of the road.’ That’s now been moved to stage 3b, and only metastatic disease is stage 4,” Dr. Rusch commented while speaking at the 2016 International Mesothelioma Interest Group conference. Will Patients Need a Second Opinion? Patients diagnosed within the next 6 months will not have to revisit their physician to receive a second opinion because many clinicians are already beginning to utilize this concept in their practice. However, it is always up to the patient to decide if a second opinion is necessary, especially if they are concerned that their stage may be limiting their treatment options. How is malignant mesothelioma staged?. American Cancer Society. Retrieved from: http://www.cancer.org/cancer/malignantmesothelioma/detailedguide/malignant-mesothelioma-staging. Accessed: 07/19/16. 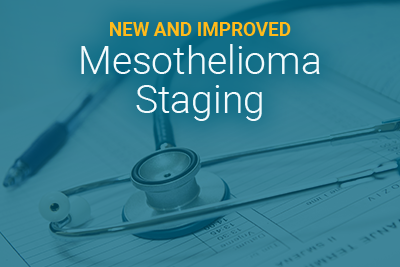 New Staging System for Mesothelioma to Take Effect in 2017. Mesothelioma Applied Research Foundation. Retrieved from: http://blog.curemeso.org/staging-system-mesothelioma-effect-2017/. Accessed: 07/19/16. TNM. UICC. Retrieved from: http://www.uicc.org/resources/tnm. Accessed: 07/19/16. Staging. National Cancer Institute. Retrieved from: http://www.cancer.gov/about-cancer/diagnosis-staging/staging. Accessed: 07/19/16. Mesothelioma. Vanderbilt University Medical Center: Department of Thoracic Surgery. Retrieved from: http://www.mc.vanderbilt.edu/root/vumc.php?site=thoracic&doc=3594. Accessed: 07/19/16.